The Hidalgo County Adult Detention Facility seen on Wednesday, July 19, 2018, in Edinburg. EDINBURG — Inmate overflow at the Hidalgo County jail prompted the signing of a memorandum of understanding Tuesday between the sheriff’s office here and in Starr County, but it’s unlikely any transfers will occur soon as Starr County’s jail is being used to house detained migrants charged with illegal entry. “Because of the federal government’s stance on zero tolerance on immigrants, there are more inmates being held in these federal facilities, and the federal government pays more than what the county pays,” Hidalgo County Sheriff J.E. “Eddie” Guerra said. While a county jail, the Starr County Adult Detention Center also contracts with the federal government to house federal inmates, which is why its jail is at capacity and unable to alleviate Hidalgo County of its overflow due to lack of bed space. The Hidalgo County Adult Detention Center has been short on bed space since it first opened in 2003, said Guerra, who was elected in 2014. As a result, Hidalgo County has had a longstanding agreement with GEO Group, a private-prison company, to hold its inmates in the Brooks County Detention Center, one of its facilities which accepts both county and federal inmates. If that facility is full, GEO Group is then tasked with finding appropriate housing for Hidalgo’s inmates at its other facilities. The Texas Commission on Jail Standards lists Hidalgo County jail’s capacity at 1,232 beds with every inmate held there assigned a bed. It only has capacity for 100 female inmates, Guerra said, adding that when the jail opened in 2003, nine female inmates had to immediately be taken out of county lockup since there wasn’t enough space to house them there. “If you look at the population of Hidalgo County versus the number of jail beds, we could have built a 2,000-bed jail (in 2003) …” Guerra said. “However, county government at that time decided to save money and eliminated 700 beds. The MOU with Starr County resembles an agreement Hidalgo County signed with Jim Hogg County on June 19: The Jim Hogg Adult Detention Center and the Starr County Adult Detention Center — which have 48 and 275 beds, respectively — will house Hidalgo’s prisoners “on a space available basis” at a rate of $54 a day per inmate, the same rate it pays GEO Group. In comparison, it costs the county $6 less to house inmates at its own jail. Hidalgo will also pay “all hospital, mental health, or other health care services and any prescription drugs” its prisoners may require at Starr and Jim Hogg’s jails, per the MOUs. Since his tenure, Guerra estimates Hidalgo County has had up to 360 prisoners housed at facilities in other counties and as few as 46, noting the number fluctuates. Last year, the county spent $3.8 million housing inmates in other facilities, according to Guerra, and it booked in approximately 21,000 inmates over the course of the year, an increase of nearly 2,000 since 2016. Since the start of 2018, 12,236 inmates have been booked in the county’s jail. 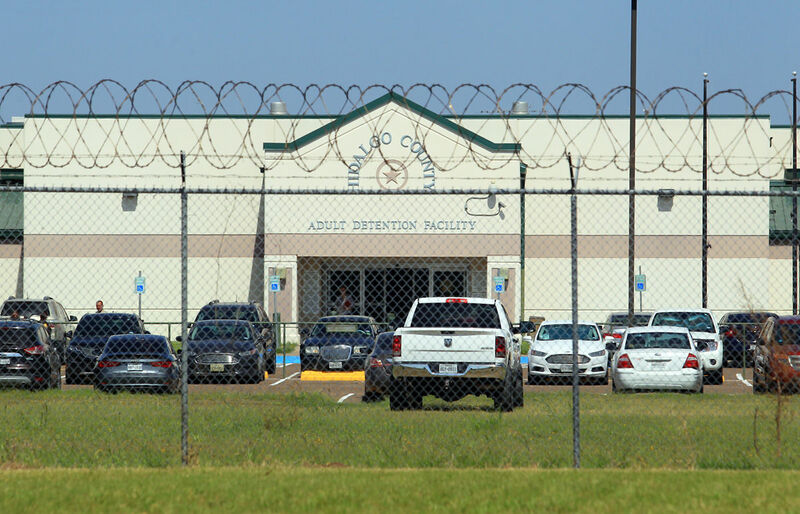 The Hidalgo County Sheriff’s Office is faced with the challenge of remaining in compliance with the Texas Commission on Jail Standards, which governs county jails and any jails that hold county inmates, like GEO Group’s facility in Brooks County. These standards, Guerra said, “are a lot more stringent than the federal system” in terms of guard to inmate ratios and other protocols, such as random inspections. Were HCSO to put down cot beds, for example, it would be in non-compliance, and the county would be required to come up with a plan to immediately fix the situation or risk being shut down by the state. Guerra said HCSO is considering a range of short-term options, among them building five barracks behind the jail which would add 240 beds for minimum security inmates. A long-term solution, he said, would be expanding the jail by at least 700 beds, something likely out of reach in the next few years, given the county’s immediate focus on building a new courthouse.